Disney has found a way to breathe new life into the studio’s classic properties, through live-action adaptations and remakes. Now a true Disney queen is coming back to guide us once again. MARY POPPINS RETURNS arrives on December 19, with Emily Blunt as the wise and magical nanny Mary Poppins. The original classic, which featured Julie Andrews as Mary, is one of the most dearly-loved Disney films of all time. A key part of the original appeal is the music. When we think of Mary Poppins, the song “Supercalifragilisticexpialidocious” follows immediately after. 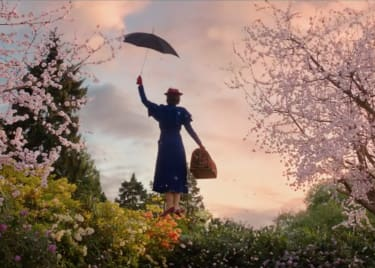 MARY POPPINS RETURNS is a sequel, however, not a remake. So screenwriter David Magee and producer Marc Platt chose not to go back to the original songs. 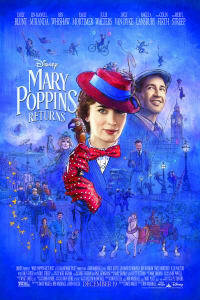 MARY POPPINS RETURNS has a soundtrack of brand new songs written by Marc Shaiman and Scott Wittman, designed to appeal to fans of the classic while winning over a new generation. Here’s what we know about the new music. First, let’s look back to the original MARY POPPINS, released in 1964. Several songs from that film have been enshrined as musical classics. That means it’s difficult to hear them and not immediately think of the original movie. “We wanted to make sure that when you started our film, you were watching a new story, a new installment,” Magee explained to EW. So the new movie needed new songs. Disney knows the new songs will have to win people over. The studio is slowly teasing the new compositions. One recent Special Look introduced a few notes from “Can You Imagine That” in a trippy sequence in which Mary Poppins takes the kids on a bathtub adventure complete with dolphins. The soundtrack also includes “The Place Where Lost Things Go,” a song that’s expected to be about memories. There’s “The Royal Doulton Music Hall,” which features an animated sequence in the vein of the classic “Supercalifragilisticexpialidocious.” (Expect to see some easter eggs in that part of the film!) 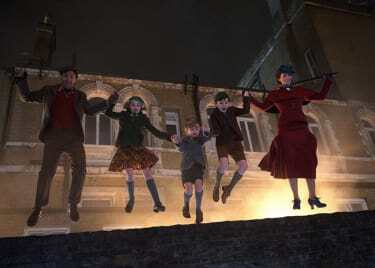 One of the songs features Mary and the children recounting their day to the lamplighters. It’s the sequel’s version of the chimney sweep song “Step in Time,” and apparently uses a rhyming slang that even Poppins is somehow able to speak. “Turning Turtle,” meanwhile, features Meryl Streep as Mary Poppins’s upside-down sister. The set for Streep’s character’s home has literally been described as upside-down, which echoes the Uncle Albert sequence in the first film. Other new tunes include “A Cover Is Not The Book” and “Trip A Little Light Fantastic.” Finally, “Nowhere To Go But Up” appears to be the emotional and thematic coda of the film. We’ll perhaps hear this song as Mary Poppins inevitably ascends back into the heavens. 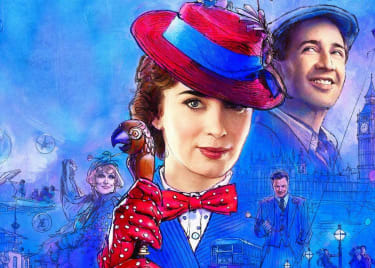 All the new tunes will be unveiled when MARY POPPINS RETURNS opens on December 19.